2011 Cobalt 276 fully loaded in showroom condition with less than 25 hrs, always stored indoors. Yacht certified. Mercruiser 8.2 Mag Bravo 3 engine (380 hp) w/DTS (Merc) enhancement. Features include: Dual battery, In-dash GPS, Premium sound system w/transom remote control, Satellite radio, Docking lights, Fender clips, Flagpole w/flag, Portal light, Stainless steel arch w/bimini top, Swim platform w/transom lighting, Transom shower, Transom tilt switch, Aft walk through carpet, Air compressor, Bow lounge filler cushions, Dinette table w/receptacles, Faucet cockpit sink, Head w/electric porcelain toilet, Stainless steel foot tread, Dual battery switch, Cruise control/Perfect Pass, Automatic Fire Extinguisher system, Toolkit, Trim Tabs, Windlass Chain and Anchor. Includes Bow tonneau, cockpit, and mooring covers. 2011 Rolco trailer custom built for Cobalt 276 included. 2-Year Cobalt warranty remaining. Warranty is transferrable. 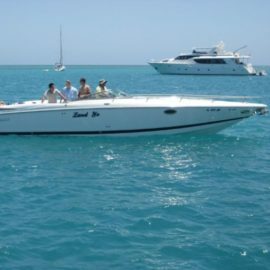 Buy my 2011 Cobalt 242 Open Bow Day Boat!